Cleaning up vomit is very nauseating. It means more work, more of bad odor and removing unpleasant stain out of the carpet. Of course it is one of the worst jobs to do. Cleaning up vomit is bad enough, but when it falls on your carpet, it is the most irksome job that is distasteful to do. But the job has to be done and you can try a few tricks to do it as easily as possible. If you have a carpet cleaning machine, the entire job is made very easy. There are various ways of cleaning up vomit from the carpet. Just try the best that you think is right. Some prefer to let it dry out, before cleaning, while some prefer to clean up the mess immediately. Just follow these simple tips to clean it, in whichever method you prefer. By using them in your carpet cleaning machine, the entire work is made easier. Cleaning up the mess immediately is preferred by some. In such cases, you have to remove the vomit from the carpet. This can be done using a dust pan. You can also use a paper towel to do the work. Absorb the moisture so that it does not seep into the carpet, using a paper towel or an old cloth. Sprinkle the area with some baking soda or some corn starch to help absorb the remaining moisture. You can allow it to set for about 10 minutes. The baking soda can then be vacuumed away. This will remove the wetness away from the carpet. Dry cleaning fluids can be applied, to remove the vomit out of the carpet. They do not involve any wetness and does not require any drying. Clean up the mess immediately using dust pan, paper towel and old rag. Remove the leftover residue. Apply laundry detergent on the wetted area of the carpet. Brush it with a stiff brush. Vacuum out the water with a vacuum. You can repeat the entire process to remove the entire content from the carpet. If only the water and the soap remains, you can vacuum it repeatedly. It is easy to clean up vomit that has dried up. However, having it in the room and allowing it to dry is a very nauseating situation. If you can put up with it, you can go ahead with this process. . If you try to wet it and blot the mess on the carpet, it will push it deeper into the fiber of the carpet. This will penetrate deep into the carpet. But, if allowed to dry, the mess will remain at the surface and it is easier to remove it. All you have to do is scrape the dried up mess. Then vacuum the area. You can use any type of cleaning method mentioned above to remove the odor. You can use a small dustpan to remove the vomit from the carpet. This will remove all the hard substances that are most icky to see and to smell. Using a dust pan is much better than using a butter knife or a spatula. If you have a pet dog, it is bound to poop or vomit on the carpet. It is part of having a pet in the house. Though the cleaning process is very nasty, the mess has to be cleaned up. 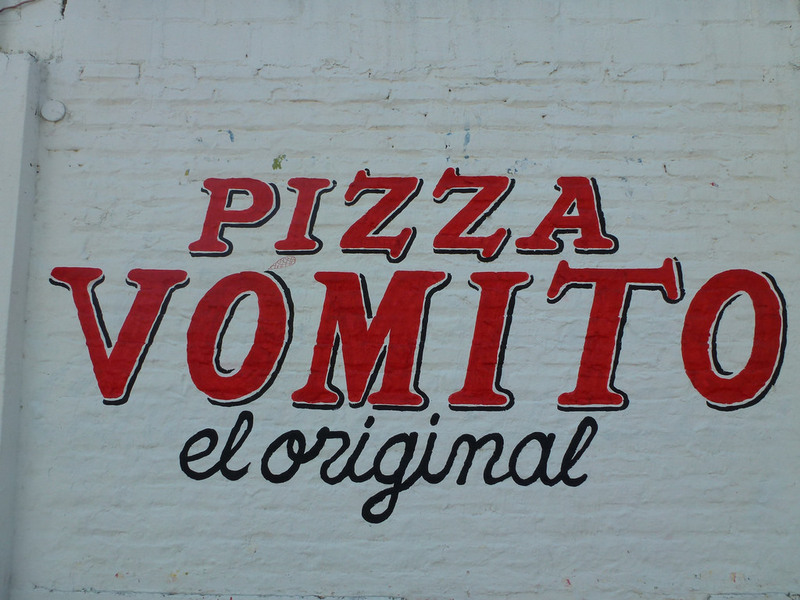 It is best to clean up the vomit first. They using a wet rag, the carpet can be slightly dabbed. A thin layer of baking powder can be applied on the messed up area. Allow it to set and then remove the remaining mess. You can then spray a mixture of white vinegar and warm water on the area and then vacuum it up. It should be completely dried up. The baking powder will remove the odor too. Carpet cleaning machines do a wonderful job of it. To remove the odor, you can apply any cleaner into the carpet cleaning machine that has an enzyme base. Sprinkle it all over the place. Allow it to set for a few hours. Blot it out with a paper towel. This will remove all types of odor and stain, as well as making the cleaning complete. You can then air it out, to remove all type of odor from the interior of the house. You have to vacuum the area to remove the moisture content that may be remaining. Baking soda can be mixed with water to a thick paste. Apply a thin layer on the stain and then it can be removed with an old toothbrush or with a brush. You can also add peroxide to it, but it will cause a stain on the carpet which may not look good. You can also add a few drops of dishwashing liquid to it. After it dries up, you can scrape it up with a butter knife. The stain and the smell will go. As vomit is acidic in nature, you can also combine vinegar with baking soda to neutralize the smell and remove all traces of the puke from the carpet. It can be allowed to dry and then vacuumed up to give a clean look, without the odor. You can also apply talcum power over the patch. Talcum will soak up the moisture and will also help to relieve the odor. Eucalyptus oil drops can be put into the soapy water along with elbow grease to remove stain and smell. Cleaning dirt and grime from the carpet is a tedious job. But cleaning puke and poop is an even harder task to be completed. If you have BISSELL Big Green machine, you can get the job done easily. The entire job is made much more bearable. Choose the carpet cleaner according to the area to be covered in the house and the requirements of the place. It also depends on your budget. Make the time-consuming and difficult job much easier, with a handy machine.